Put your hands together for Jeff Janssens -- AKA the Masticating Monkey -- who will be writing the Eat This feature here at AOA. I realize I might be starting off on the wrong foot here as the new caretaker of the Eat This! column. In the middle of this hot summer, I'm recommending a stew--a not-particularly photogenic one, at that. I hope this says something about the oxtail stew at The Dutch Pot in Albany. This is a plate of meaty, saucy goodness that showcases such a satisfying medley of flavors that it's worth seeking out and eating anytime, anywhere. 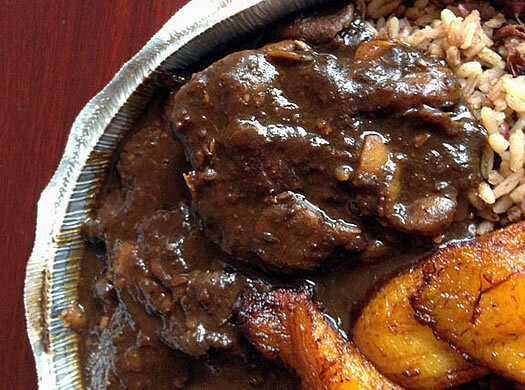 A classic Jamaican meal, oxtail stew has roots that stretch from Africa to the American South and into the Caribbean. From the tender oxtail to the assertive pimento and scotch bonnet flavors, its not an exaggeration to say you can taste that tradition throughout The Dutch Pot's oxtail stew. The restaurant's oxtail stew pays proper homage its namesake -- a Dutch oven, the cast iron or cast aluminum cooking vessel also known as a dutchie. This is a dish that must be cooked low and slow for several hours, though to keep the cooking time to only around six hours, Danielle Davis, the owner and chef at The Dutch Pot, moves the process along by using a pressure cooker. Oxtail, which refers simply to the meat found along the tail of a cow, is relatively foreign to many American diners. In fact, because few cattle are actually raised in Jamaica, even in that country it's imported from the United States. And just like in the American South, Jamaicans regularly eat parts of the cow many Americans might initially blanch at, such as tripe or intestines (commonly known as chitlins in the South). 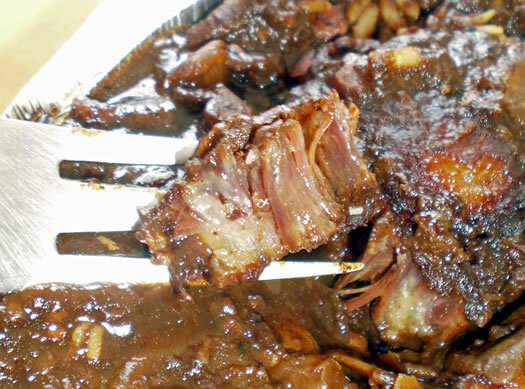 "I think [the tradition of eating oxtail] came over from Africa when our forefathers came over," says Davis. "If you go back to slavery, you'll find that the slave owners would eat the choice portions [of the protein] while the slaves would get what's left: the entrails, the heads, the feet." While oxtail isn't a choice cut, it is an excellent part of the cow for stewing. Its fatty, gelatinous nature is perfect for all the flavor it imparts the stew during the cooking process. By the time it's served, the meat should be falling off the bone. You can eat it with a knife and fork, certainly, but before long you might find yourself picking up the oxtail in your hand and sucking off any last edible bits. And those are especially worth savoring because of the sauce the oxtail is stewed in and then served with. Davis says she uses a blended seasoning of scallions, onions, thyme, and allspice (known as pimento in Jamaica), plus an imported oxtail spice mix from Jamaica. To temper the sometimes salty nature of such a seasoning blend, she adds lima beans, which soak up the salt and mellow out the sauce. In the end, the dish features a bit of heat (likely from the scotch bonnet pepper that so frequently stars in Jamaican cuisine) but never an overwhelming amount. The rich, savory blend of flavors is front and center; the thyme, which Davis seems particularly fond of, creates a noticeable layer of depth to the sauce, while the freshly-crushed pimento seeds showcase a bright earthiness, providing hints of cinnamon, nutmeg, and clove. The Dutch Pot has been open for just over a year, operating out of a small storefront on Madison Ave, just off the busiest part of Lark Street. With a few tables inside and a couple on the sidewalk, Davis -- a life-long resident of Jamaica until she moved to the Capital Region five years ago -- says of the space, "What I wanted to do was to not have a hole in the wall, but a classy ambience. Eventually I'd like to have a bigger spot where people can sit down and have more of a fine dining experience." For now, it's a perfectly adequate spot to eat in -- where you can enjoy the rapport between Davis and her many frequent customers -- or pick up food to eat at home. 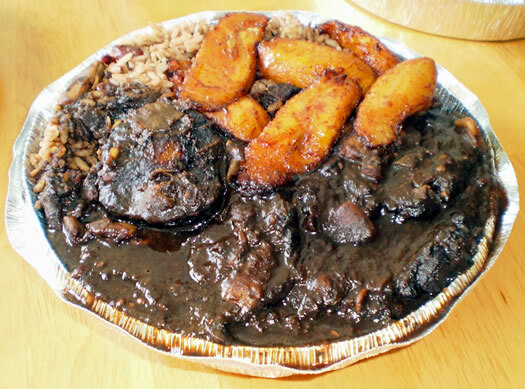 The oxtail stew can be ordered as part of a lunch special for $7.99, where it can be accompanied by sides such as the always sweetly delicious fried plantains, or as part of a meal -- $8.99 for a small and $10.99 for a portion large enough to adequately fill two hungry diners. Even if you're not able to find an air conditioned room in which to eat your oxtail stew, maybe the moderate heat of the dish can turn on your body's natural air conditioning. Or it could create the illusion that you're actually on vacation in Montego Bay, sitting outside on a beach patio, sipping on a ginger beer while enjoying some authentic and delicious Jamaican cuisine. Been wanting to go the Dutch pot for a while! Hoping to make it there next week. LOVE the Dutch Pot! I haven't tried their oxtail yet (although it looks so tasty in these pictures I nearly licked my screen), but their jerk chicken/mango wrap is delicious. Everything I've ever had at the Dutch Pot has been fantastic. Some of the best food in the city. Great story. So many people want Jamaican food to be fiery. But eating good food shouldn't be about feats of strength. Personally, I'm not so into sweating. But I'll look forward to some oxtails the winter after I return from New Jersey. 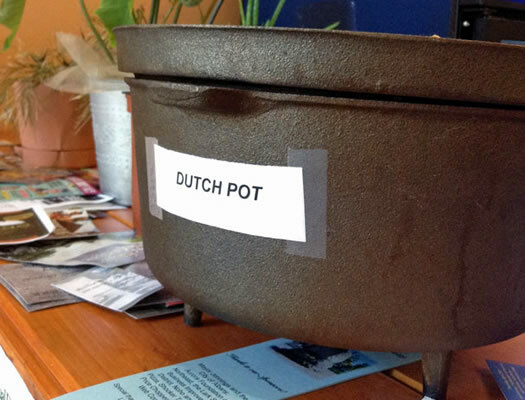 I order from the Dutch Pot on a fairly regular basis. The oxtail and curry goat are sublime. The jerk chicken is also one of my favorite items -- it's got some real heat, but not it's flavorful heat, not just heat for it's own sake, if you know what I mean. The mac and cheese is also mildly spicy, made so by the addition of some type of pepper, possibly jalapeÃ±o. I have never had a bad meal, and I would highly recommend trying the Dutch Pot if you haven't already. I hope they'll be in business for a long time. Came to this article a little late... sorry for the belated comment. 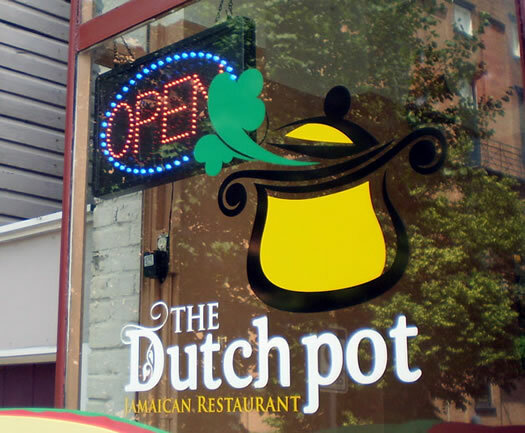 I'm really looking forward to trying The Dutch Pot... now I'm thinking perhaps tonight. There's nothing that quite equals a great oxtail stew, and your post had my taste buds jonesing overtime at 9:30 a.m. ... thanks for the great write-up! And thanks additionally for the great work you do over on Masticating Monkey. If you're in the area, please do stop in and support this small, local business. Over the weekend, some jerks smashed the window on the rented van they use for the business. (I heard someone yell something about "crack that window," heard a loud smash, then someone yelled "Run!" I looked out my door just in time to see two young guys vanish around the corner.) I talked to the owner this morning and she's understandably upset. This is going to create a hassle with the insurance and she admitted the business needs customers. The food is quite good and they could use some help. So, if you're in this area at lunch or dinner time, think about having something Jamaican.